Whats better than the waterbed connectors for connecting hose to sacs? I went to Home Depot but they don't have anything that matches the threads in their plumbing dept. So I did pick up some waterbed ones from a matress store but I wonder how long they will last and how leakproof they are. Mainly concerned with a bottom valve of the sac connection not leaking. I used a barbed fitting that clamps inside of the sack that adapts to the right size for the hoses that you're using. If they don't have the right size, a plumbing store would have or be able to get whatever you need. I was able to find some clear tubing that fit correctly inside the valve on my sack. Then it's just adding a rubber coated hose clamp to secure it. Huh - for some reason I was hoping this topic was about me.. I didn't get much done this weekend and am still mapping out the strategy. I think I want to connect the bottom valve to the bottom valve of an auxillary sac to go under the seats. That way it can be drained as the main sac drains. 1) Use 1" barb and hose clamp in bag. 2) Use 3/4" barb with a 3" long 3/4" hose (with 5-6 holes drilled in it) attached to the bag. I used the 90 like Kelly shows, & then a garden hose fitting into that (actually a male to male adapter, then a female garden hose fitting - I thought that would be easier to use as a quick connect). I didn't use zip ties, but clamps instead. Yes I agree no zip ties. Also, I used the clamp on the outside of the bag on the opening of the bag. That way it sandwiches the bag opening to the fitting. Well I got it put together. Got the hard tanks out and put 440lb Launch Pads on each side of the trunk of the LSV. I was hoping to drain from the top but the pump (with waterbed fitting) just won't quite pick up the water with some coaxing by pushing on the bag. Will installing the drain pump on the bottom valve solve this? Agree, the pressure from the water will keep it primed. Depending on the pump & whether or not you have a threaded or barbed connection to work with you may be able to go straight in to the bag like Troy said. The threads on the pump are are garden hose size. What size fits in the valve of the sac? BTW the Launch Pad that I have does not fit the threads of the waterbed fittings - the Fly High I'm borrowing from Caleb do though. But not too importatnt cuz I'm ditchin 'em anyway for hose clamped connections. *I think* that if you use a waterbed adapter fitting (blue, perfect unions) then the pump will screw right into it. I just wonder about the durability of that setup. You could get a barbed fitting to go in the sack that would be clamped that adapts to a garden hose fitting, that would work. I believe the barb needs to be 1", but somebody backstop me on that because I can't remember off the top of my head (& it also might depend on the bag). If you know that the blue waterbed fittings will work & don't want to use them, you can always take one with you to Home Depot (I'd actually recommend a dedicated plumbing supply store) to get exactly what you need. 3/4" PVC fits very tight into the conection on the sac. Is that a black zip tie I see holding the fitting to the sac? One thing I was going to try was to stick a hose down inside the bad a ways. I'm hoping the sac will drain better that way. Yes, that is a zip tie. The tubing was so tight and they are not built in, so I didn't want anybody to cut there hand on a clamp, nor did I want to put some tape around them. I only extended the tube about an inch or two into the sacs, again, they are not built in. I also like the tight fit of the hose connection for the fill line and for the caps. I had thought about using a flexible line with a barbed connection, but that reduced the opening size by about 1/4" dia. As it is, my pump has a 1" line on it. The connection has a 3/4" ID, so I have already lost 1/4" in dia for the connection. If you extended the PVC into the sac and sand the end smooth, that may work as well as a flex line. I would consider drilling some holes near the end to allow as much water as possible to get sucked out of the sac. OK I got the drain pumps plumbed in the bottom valves of the 440s in my trunks. Drains great but now have another little problem. Bag only fills about 3/4 then water comes out of the drain thru hole - thats as much pressure as the drain pump with hose goin straight up to the fitting will stand I guess. But my goal is to operate totally from the drivers seat. 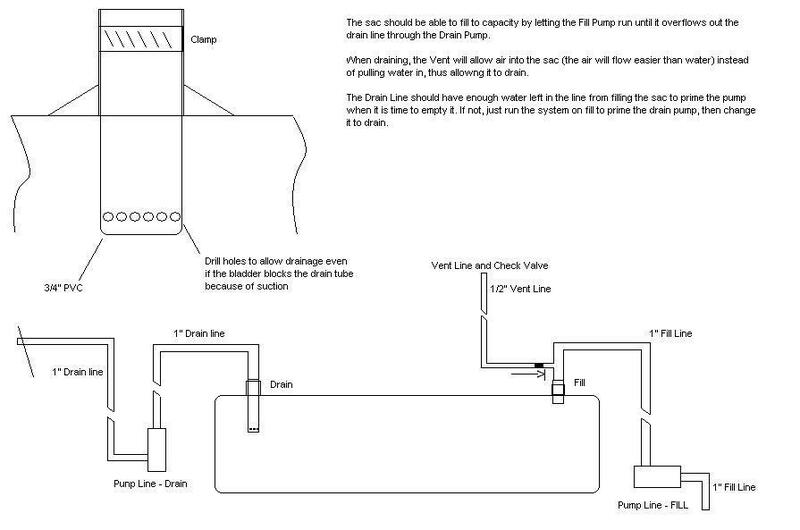 I had this in mind when thinking about how to plumb the Fill/Drain lines. That is what I was thinking. The vent would stop any siphoning from the fill side by allowing air into the fill line, breaking any siphon. Just from filling sacs on the floor, there is always air in them. Lots of air. But then again, with a more permanent system that is basically sealed, you may not get much air in it unless it comes from the drain side. Possibly another check valve to allow the water out, but no air in? A friends boat has trouble with the hard tanks always over filling when he is under way. The tank bulges enough to open his hatch a little if he has a bunch of stuff in it (Super Air). Enough water cannot escape through the vent. His pumps are inline with each other flowing in opposite directions. It fills and drains from the bottom of the boat. ??? I think it would help if the sacs and tanks had another fill point at the lower section of an end. By lower meaning a fill point straight up and the end one at 6 o'clock. I thought you were having an issue with the sacs filling all of the way? I got a couple of Brady line check valves that I'm gonna try in line between the drain pumpand the output gunnel hole. Maybe that will give just enuff resistance to keep the sacs full.